KOFUP currently supports nine projects in Kenya. We would like to thank everyone who contributes. Without doubt you have helped, and are helping, to change lives and give hope. Ujuang'a is in Asembo, a subsistence farming community close to the northern shore of the Winam Gulf in Lake Victoria. In 2001 KOFUP began a partnership with the bishop of a local church to support the meagre resources of the local efforts on behalf of orphaned children. The area is home to hundreds of orphans. IMPACT: KOFUP supports the Ujwang’a Orphans’ Programme with funds for school and college fees, nutrition support, health-care and training in child-care and micro-finance. The number of children in our Ujuang'a programme has grown steadily from 31 children in 2001 to more than 400 today. The number of orphans entering secondary school increases yearly. Several are currently studying at university. NEEDS: The area suffers from inconsistent rains and unpredictable harvests. There is virtually no opportunity for paid employment. Most people survive by farming small plots of land and by micro-business enterprises. With an increasing number of teenage orphans, there is a great need of vocational courses, as well as business and small-scale industry development training. With sufficient funds KOFUP could make an even greater difference to the hopes and aspirations of the young people of Ujwang’a. The Kasirawa Child Integrated Project in Western Kenya is a recently-formed home-based community group currently providing support for 100 children in this extremely dry part of the country where soil fertility is very poor and people rely heavily on fishing from Lake Victoria to make an income. Poverty and rampant disease have in many cases eroded the bonds of extended family leaving the caregivers, mostly young widows, struggling to provide for their children. The project has appointed a management committee composed of nine of the caregivers and links have been made with the Ministry of Health, Ministry of Education, Children’s Department, Provincial Administration and local church leaders, so making this a strong community initiative. IMPACT: KOFUP ‘s collaboration began in 2013. Funds are paying for nursery fees and school uniform for the children who would otherwise not be able to access Early Years education; a feeding programme; and training for community health workers whose role it is to do home visits, provide psychosocial support to the children and refer them and their families onto health facilities when they need medical intervention. Kasirawa children enjoy the shade of the trees. NEEDS: Life is extremely hard for the families and many of the children are missing out on education so tying them into a life of continued grinding poverty. With further KOFUP funding the community can grow stronger and educate more and more of their children, giving hope for a brighter future for the next generation. Kahawa West is a poor township about 30 Km north-east of the Kenya capital, Nairobi. It is named after the coffee plantations that used to cover the slopes. (“Kahawa” is the Swahili word for “coffee”). Nowadays it is a sprawling estate crowded with houses of varying quality and with large slum areas. Soweto is one of those slum areas in which members of the Community of Pope John XXIII, an Italian lay missionary society (http://en.apg23.org ), live and work. IMPACT: KOFUP supports some of the Community’s work with orphans and street children. Our funds have paid for facilities in the street-kids’ centre as well as fees for school and vocational training. NEEDS: KOFUP’s assistance has brought about a great improvement in the life-chances of some young people but the levels of deprivation in the slum are so profound that our current contribution only scratches the surface. Precious Tears Initiative is a 5-day holiday camp for teenage girls in Yiro, Western Kenya. The camp, the first of its kind in this area, was held in December 2013 at the JOHCLE Skills Development Centre and Safe Space for Girls. The local community was very supportive, providing items such as tables and chairs and food whilst KOFUP gave a grant to help with the running of the camp. Twenty-seven girls attended, aged between 15-19yrs, all orphans having lost one or both parents. Seventeen of the girls are at secondary school, many of them heading up their households looking after younger siblings; ten of the girls were at the point of finishing primary education and living with elderly guardians. There were five ‘mentor mums’ to help guide the girls through the week. Following the camp the girls formed themselves into the Yiro Girls Network. The network gets together once a month and two of the trustees were delighted to join some of the girls at their meeting in July this year. They told us how they are sharing what they are learning with other girls at school to help empower them and encourage them to join the group. They hope to link up to other girls’ networks, one way being through sports such as netball and football, to which end KOFUP gave them some funds to buy some sports equipment. They have started a small income generating activity making reusable sanitary wear to sell to their peers and initiated their own table banking scheme to help manage their finances. NEEDS: To avoid early marriages which are often arranged by extended families against their will, orphaned teenage girls need job opportunities for financial independence or funds to continue their education. KOFUP’s challenge is to find sufficient funds to support the Yiro Girls’ own efforts. The Atemo Mixed Secondary School is a day school serving the extremely poor community of Ringa in western Kenya. The school has grown steadily over the years from 37 pupils when it first opened in 2000 to currently 513 – 311 boys and 202 girls (summer 2014) – over half of whom are either semi or total orphans. In Kenya, secondary school fees apply and many headteachers will turn away a child who cannot pay. At Atemo, headteacher, Joseph Nyariaro seeks out children with potential and is particularly committed to educating bright children from the poorest families and he won’t turn any of them away even though, in many cases, they can’t afford the fees. It was this enlightened approach that drew KOFUP into collaboration with the school in 2005. IMPACT: KOFUP funds make up for the shortfall in fees by providing bursaries for the poorest children. Over the years KOFUP funding has enabled Atemo to develop steadily into a fine secondary school, now one of the most popular in the district, with a growing number of children each year gaining grades that make them eligible for university entrance. The Mama Always Programme was started at Atemo in 2009 in response to a request from Joseph regarding the needs of the girls who were missing a week of their education every month because of their menstrual cycles. KOFUP funded the cost of sanitary wear and the absenteeism rate dropped dramatically in that first year. In the following year the top three students in the school were girls and the girls have continued to perform well with several achieving university standard grades each year since. NEEDS: The greatest gift you can give a child is that of education. With continued funding we can give more children hope of being supported through secondary school to achieve grades that allow them to go onto further education. Headteacher Joseph Nyariaro hopes that within a decade there will be a growing number of professional people whose education at Atemo gave them the opportunity to make a future for themselves and their families and who will give something back by supporting the next generation of children in the community. RICCDEP (Raroki Integrated Child & Community Development Programme) is a community initiative in a deeply impoverished rural area by the shores of Lake Victoria. Their aim is “to use local resources to build the capacity of the local community to tackle their own challenges and those of their neighbourhood”. The population of about 300,000 depend on subsistence farming despite irregular rainfall and poor soil – the area got its name, “Raroki”, from the “rocky” nature of the soil and landscape. Some people, especially widows, engage in quarrying stone for use in buildings. This is done by hand and is heavy, dangerous work, offering small rewards for back-breaking labour. KOFUP trustees first visited RAROKI in 2005 and were impressed by RICCDEP’s efforts to mobilise the community to tackle their own problems. They were, however, struggling with the growing number of orphans as well as the rising death rate of the 25-40 year-olds. The trustees felt this was an area of dire need and that the RICCDEP leaders were people we could work with. KOFUP was presented with a well constructed and detailed funding proposal for a programme to support at least 300 children. The projected cost of the plan was, and still is, beyond our financial resources. We help with the provision of schooling for orphans and have committed to increase the level of assistance as funds allow. Kisumu, on the shores of Lake Victoria, is the third largest city in Kenya. The many slums which surround it are home to thousands of people struggling to earn a living and provide for their families in the most basic living conditions. HIV/AIDs remain major health problems along with TB and malaria. In the heart of the Nyalenda slum, the Pandipieri Centre provides informal schooling for street-kids, a streetchild rehabilitation centre, healthcare, nutrition support, vocational training, including a thriving art school. Since the early 2000s KOFUP has been funding an orphans’ programme, to enable orphans and desperately poor children and young people to access education through paying fees, providing food, clothing and other basic needs. Two corrugated iron shacks in Kisumu’s Manyatta slum house a nursery school for the orphans and vulnerable children of the area. 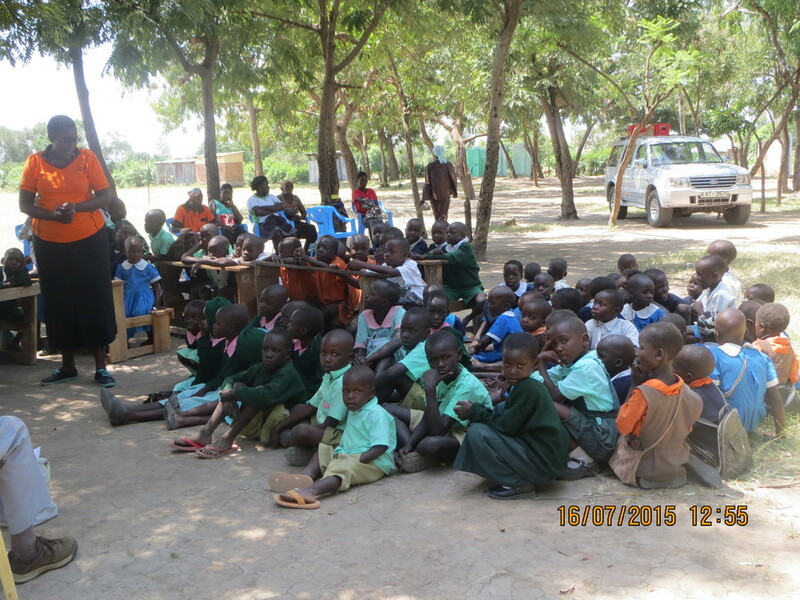 Early years schooling in Kenya is not free, yet is necessary for admission to primary school. The “Mini-Nursery” prepares the kids for primary school and provides meals without demanding fees. KOFUP has helped with the provision of clean water and underwrites the feeding programme. Kisii town is over 2 hour’s drive from Kisumu, in the fertile Kisii Highlands. St Christina’s School in Suneka, 5 miles west of Kisii, offers high quality education to children from the surrounding area. It is a private, fee-paying school but is committed, with KOFUP’s support, to providing guaranteed places for orphans or vulnerable or destitute children.